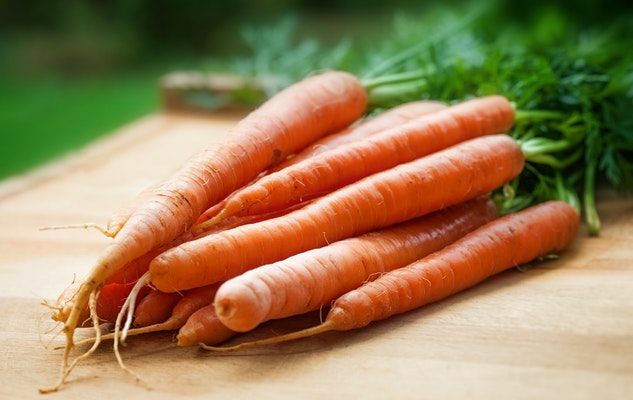 Given the omnipresence of carrots in our diet today, it’s hard to believe that up until the 19th century, this vegetable was hardly eaten by humans as it was mostly used for feeding cattle. But surprisingly enough, it has been around since 3000 BC, but in its original form, which was more fibrous and bitter, making its medicinal and even ornamental properties more valuable. It’s only in the 16th century in Holland that the ‘modern’ carrot emerged, following a crossbreeding between a red variety and a white one that resulted in a bright orange colour in honour of the Dutch royal family, the House of Orange. This new variety soon surpassed all the others and it is the most popular one today, although you do find a lot of maroon and purple varieties in the market now. From a nutritional point of view, the carrot is a real champion, as it is packed with vitamins and minerals, including precious vitamin A. Its dark colour signifies the presence of carotenoids, a family of antioxidants that helps in the prevention of cardiovascular diseases, certain types of cancers and certain degenerative illnesses associated with aging. Originally published in the Journal de Montréal on January 15, 2011.